Retirees already have plenty of things to be concerned about. Now, they can add tax planning to the list. Anyone who has taxable income needs to file a tax return each year, and does a certain amount of tax planning throughout their life. Sadly, this process doesn’t end at retirement. When it comes to paying taxes in retirement, it may seem like there would only be a minimum amount of planning necessary, especially if Social Security and some basic investments are the only income sources. But that is far from the case. In fact, failure to plan for taxes properly can be one of the biggest mistakes a retiree can make. It’s like lighting the fuse on a tax “time bomb” under your retirement. And no one can afford to make that mistake. It goes without saying that in retirement, any person would want to keep the highest possible amount of their income away from the IRS. The U.S. has been through a decade-long bull market, so IRAs and 401(k) plans have had time to build wealth for people entering retirement. This can provide retirees with the illusion that they are in good shape. Once the post-tax money is gone, all of your retirement income will be taxable (assuming funds are held in IRA or 401(k) accounts). You will have little to no options to minimize taxes once that happens. He suggests withdrawing some from a 401(k) now, thus minimizing taxes a retiree pays on withdrawals over a longer period of time. 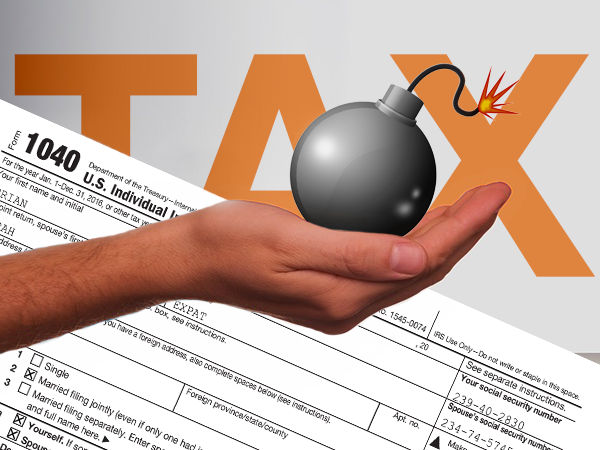 But withdrawals are only one component of the tax “time bomb” that needs diffusing. Many retirees operate under a dangerous assumption that their Social Security income is either taxed at a lower rate or they will pay less in taxes. She continues with the specifics: “If you filed as single and your combined income is $25,000 to $34,000 (or $32,000 to $44,000 if you’re married and filing jointly)” then you could be taxed on 50% of your benefits. If your combined income was higher than the upper limits for single or married filers, you can be taxed on 85% of your benefits. And don’t forget those HSA distributions. According to Matt Zagula at Forbes, they can add to your provisional income too. Then there’s Medicare part B and part D premiums. If your combined income from two years earlier (in this case 2016) is more than $85,000, your premiums increase drastically. You can get more information from the current Social Security Administration pamphlet. Entering retirement doesn’t mean retirees will pay less in taxes. Proper tax planning is an important part to your overall retirement plan. You should always consult with a tax professional before making any decisions that relate to your taxes, but there are a number of legal ways to possibly reduce your retirement income tax obligations. Roth IRA, Roth 401(k) and 403(b), municipal bonds, and even some forms of cash life insurance all may qualify. Having an IRA that’s backed by precious metals is another possibility for your retirement plan that many don’t know about. Forming a good retirement plan is more important now than ever. Don’t wait to get started.